What do people see when they come over for a visit? Your garden, as does your house, makes an impression on every one of them. Is the impression good or bad? Memorable or forgettable? If the mere thought of this question makes you cringe, don't worry; help is on the way. As a garden designer, I am on a mission to inspire people to stop seeing their yards as decoration for the house and to begin seeing their outdoor spaces as living things that want to come into their own. I%VIRTUAL-pullquote- Fall planting season is just around the corner, so the timing is perfect for thinking and planning.% urge you to look past the generic foundation plantings and manicured turf. Look instead for possibilities, meaning and identity. You don't need an unlimited budget. What you do need is the ability to look past your present reality and allow your space to speak to you about what it wants to become. For many of us, fall planting season is just around the corner, so the timing is perfect for thinking and planning. Let's see how to plan a memorable garden. Take stock of what you have. An appropriate starting point is to do an objective evaluation of your space. Every piece of land has its unique set of strong and weak points. A recent visit to Innisfree Garden in Millbrook, New York, drove this point home to me. This spectacular garden has an abundance of natural boulders. Embrace what you have. Instead of removing these boulders and leveling the land, as is frequently done, Lester Collins, the landscape architect who designed Innisfree, embraced them. Collins not only used them for terracing and constructing ponds, but saw their potential as sculptural elements, moving them front and center. I believe that good design helps our brains process natural beauty, because good design adds order and helps us make a meaningful connection to our surroundings. Open your mind to the possibilities. You may be saying to yourself: "But I don't have an abundance of boulders. All I have is a small urban lot." All gardens can develop their own sense of place, one that resonates with visitors and creates a deep sense of peace and satisfaction. You can begin with your sidewalk, as this photo shows. Instead of the utilitarian poured concrete slab that moves visitors from point A to point B in a predictably mundane manner, this sidewalk moves people with style and meaning. 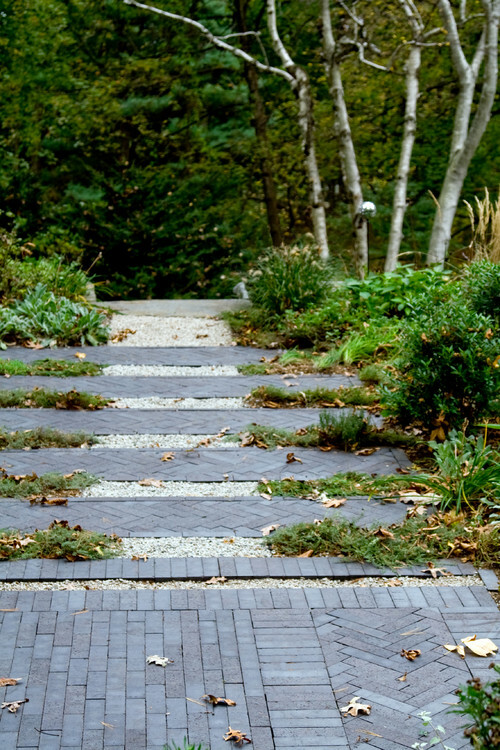 Bands of pavers extend into the surrounding garden, making a connection with it as the garden politely returns the favor. Those who travel down this sidewalk connect with the garden in a profound way that is not easily forgotten. Perhaps you have a square, flat backyard with a nondescript fence. By thinking outside the box, the designer of this space created meaning by turning the seating area diagonally. The space now has a sense of journey with a defined destination that is reinforced by the horizontal timber screen. Running the lumber horizontally instead of vertically spread out the garden visually, making it seem larger. You might never notice that the fence enclosing the garden is chain link. Additionally, by turning the paved area on axis, the designer created planting pockets so that visitors have a meaningful interaction with the garden. The square pavers also create a sense of rhythm that captivates the mind. If you have an existing patio, consider reinventing it. 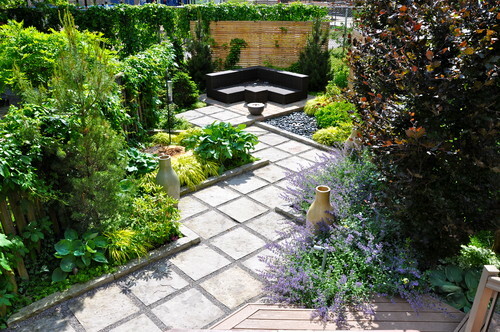 By removing portions of hardscaping, you can create pockets that are easily filled with ground covers or small sculptural shrubs. The patio shown here gives the impression that the designer thoughtfully invited nature into the space to give visitors the opportunity to meaningfully interact with it. Maybe you are dealing with a sloped lot. Instead of bisecting the space with the typical brick or concrete steps, the designers at Stephen Stimson Associates employed steel risers that deliberately and profoundly extend into the garden. 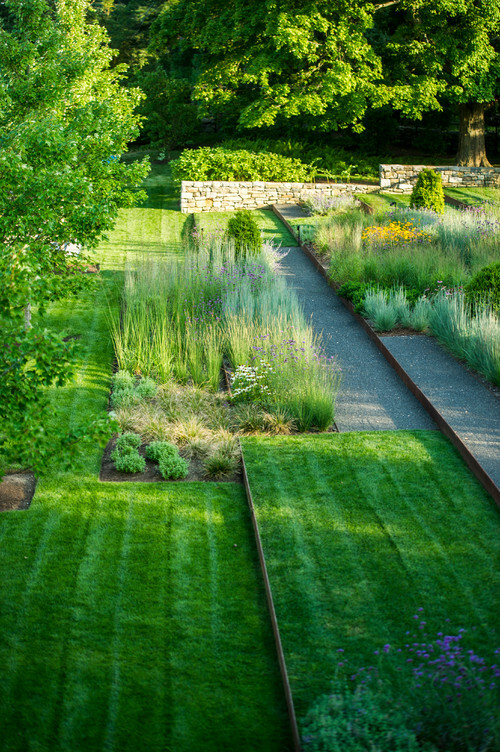 By contrasting naturalistic prairie-style plants with well-manicured turf, the designers added unexpected interest, creating a case study in texture, structure and color. If your property has many changes in grade, perhaps the less conventional answer is to tread lightly on it and create a boardwalk to carry visitors over and through it. Such a solution creates a sense of adventure that isn't easily forgotten. Consider new twists on old favorites. 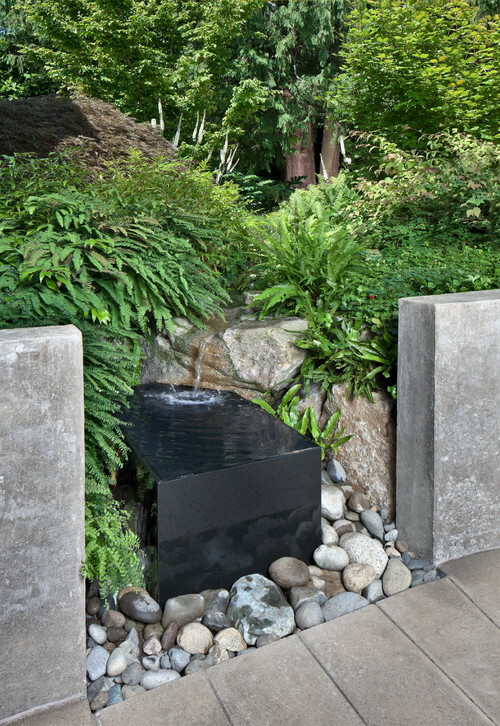 Water features provide a focal point in the garden while exerting a calming effect on the mind. We have all seen a plethora of naturalistic waterfalls and formal tiered fountains. They can be wonderful, but why not try something different to make your garden more memorable? This photo shows a contemporary basin where we would all expect a continuation of the waterfall constructed of natural stone. Subtleties and attention to detail, with an appropriate element of surprise, will set your garden apart from the norm. 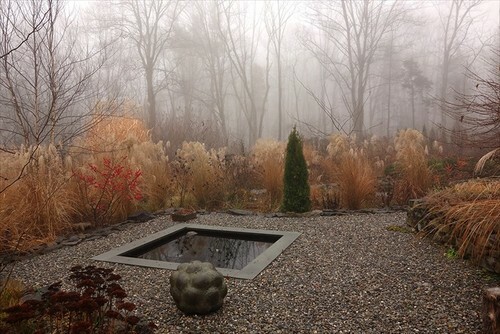 Consider this moodier water feature that both embraces and contrasts the surrounding naturalistic garden while celebrating flat, uneventful terrain. This pool conjures up images of a portal into another time; it's a unique and memorable departure from the typical goldfish pond. Rethinking sculptural accents is an excellent way to create a memorable garden experience. Good garden art is a worthwhile investment. Let me just say that the resin tabby cat or gnome found at the local thrift store will not create the memory that you want your guests to take away from your garden. Art can generate emotions and create continuity in your garden. The piece shown in this photo generates feelings of solitude, strength and even self-esteem. The sculpture is a close match in color and texture to the stone wall, creating a homogenous vibe. A rusted and weathered steel sculpture can complement a naturalized planting scheme, since the oxidation is a result of a natural process. The shape of this piece captures the imagination while still being somewhat organic. When choosing sculpture, carefully consider its size in relation to your space. Slightly larger is generally better than smaller; its impact will find a place in the minds of garden visitors long after their departure. Isn't that what we all want?